On special request we can do a 2 Day/ 2 Night option. This walk will consist of 2 of the days of the Original Wine Walk with a twist. Check-in at Diemersfontein Wine Estate and Guest House (just outside Wellington) anytime after 14:00. At 17.30 you will meet your guides. 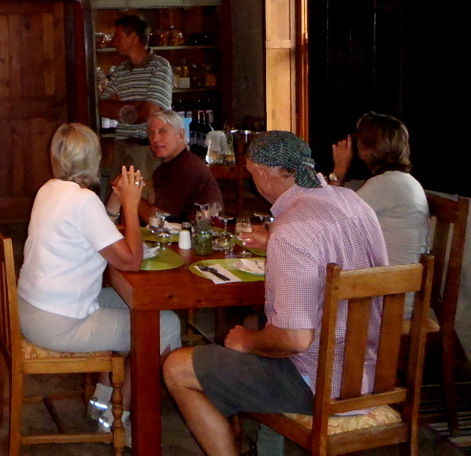 Enjoy a wine-tasting here at 18:00 followed by dinner. Bed and breakfast at Diemersfontein. 08:30 am start. Guides come to Diemersfontein car park to collect you. You will be taken by tractor and trailer from Diemersfontein Wine Estate to the foot of the original Du Toit’s Kloof Pass. Walk uphill towards Kleinbosch koppie and stroll along contour path on the koppie. Continue ascending walk above a buchu field through olive groves and head down through the recovering fynbos and descend to Cascade Manor for a lunch and olive oil tasting. After lunch proceed through more olive groves to Druk My Niet for a wine tasting. After this you have a short walk to your overnight stay at De Kleijne Bos where you will check in for the night. Level: Moderate, uphills, along contours and downhill. 08:30 am start. Guides and shuttle will collect you and take you to the road to Uitkyk Farm. We meet Elsabe in her homestead for a presentation on the healing properties of Buchu and vine propagation ("stokkies"). She also tells you about the other farming practices they are involved in and you get to taste some of the delicious products produced on the farm. After a good "kuier"we proceed on to Hildenbrand Estate for lunch, olive oil and wine tasting. From here hike past plum orchards and through more vineyards to Oude Wellington for a cup of tea/coffee and/or an optional brandy tasting. The shuttle will collect you here and take you back to Diemersfontein where your walk ends at approximately 5 pm.